BEIJING – US Treasury Secretary Timothy Geithner on Monday reassured the Chinese government that China's huge holdings of dollar assets are safe and reaffirmed his faith in a strong US currency. A major goal of Geithner's maiden visit to China as US Treasury chief is to allay concerns that Washington's bulging budget deficit and ultra-loose monetary policy will fan inflation, undermining both the dollar and US bonds. China is the biggest foreign owner of US Treasury bonds. US data shows that it held $768 billion in Treasuries as of March, but some analysts believe China's total US dollar-denominated investments could be twice as high. The Beijing-based Global Times published a survey of Chinese economists who called big holdings of US debt "risky." Geithner renewed pledges that the Obama administration would cut its huge fiscal deficits and promised "very disciplined" future spending, possibly including reintroduction of pay-as-you-go budget rules instead of nonstop borrowing. 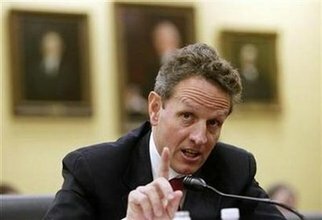 Geithner also offered strong backing for a bigger Chinese role in international policymaking. "China is already too important to the global economy not to have a full seat at the international table," he said. Geithner, who is due to meet President Hu Jintao and Premier Wen Jiabao during two days of talks, described the recession as still "powerful and dangerous" in much of the world. Recent signs of improvement were not enough to change an International Monetary Fund prediction that world output would shrink this year for the first time in 60 years. And credit was likely to be tight for some time, Geithner said. But he added: "The global recession seems to be losing force." Moreover, the US financial system was healing and it now seemed assured that the world would avoid financial collapse and deflation. But Geithner said there could be no return to business as usual either for the United States or China: both must change their growth strategies as US consumers pay down debt after years of living beyond their means. For China, which he said was in "an enviably strong position," that meant reducing its dependence on export-oriented growth. "Purchases of US consumers cannot be as dominant a driver of growth as they have been in the past," he said. "In China ... growth that is sustainable will require a very substantial shift from external to domestic demand, from an investment and export-intensive growth to growth led by consumption." To that end, Geithner said a more flexible exchange-rate regime for the yuan, which might see the value of the Chinese currency rise against the dollar, was particularly important because it would spur more Chinese demand. A stronger yuan would make imports cheaper for China and Chinese exports more costly for foreign buyers.